The Washington Back County Discovery Route: Who really conceived it? A look at the recently published Washington Backcountry Discovery Route 2011 website would lead one to believe that this is something entirely new. In fact, it is not. Various routes have existed for some time between the Columbia River Gorge and Canada along the Cascades range with both 4x4 and motorcycle adventurers making the trek. While routes may vary, it's important to note that this didn't become a reality in 20 10 as stated on the WABDR website . In 2002, two well-known riders from the Kitsap Peninsula, Herb Gaudreau and Ralph Noble, charted a course from Nighthawk to the Columbia River very similar to the tracks one sees on the WABDR website today . In 2003 , Tony Hugel released a book entitled Washington Byways: Backcountry Drives For The Whole Family (Wilderness Press), which includes many of the sections released in the 2010 WABDR tracks. In 2007 , a trip log was recorded and published online by an avid 4x4 enthusiast , Steven G. Bisig . Entitled the Washington Cascades Overland Tour 2007 the route is once again very similar to the tracks one sees on the WABDR website. In 2009, Sound RIDER! publisher Tom Mehren released his book, Dual Sport Rides through Western Washington . Mehren had ridden the Oregon Back Country Discovery Route in 2005 and felt one was needed for Washington State . Having ridden many of the same roads as the others, he hinted at releasing a future book about what he referred to as the Washington Back Country Discovery Route. See page 126 of the Dual Sport Rides through Western Washington book. Photo: Bob Owen atop Freezout Pass during the 2009 Sasquatch tour pre-ride. That tour incorporated a number of sections originally authored by Tony Hugel and Steven G. Bisig. Instead what Mehren did was create a similar route which would be used that summer for the very first Sasquatch Dual Sport Tour . Throughout the summer of 2009 Mehren, along with BMW F800 rider Bob Owen, crafted the final route making changes to Bisig 's original 2007 route. In August 2009, 54 riders rode from the Columbia River Gorge to the Nighthawk crossing using many of the same roads Bisig had driven in his Toyota FJ80 Land Cruiser in 2007. Because of his knowledge of those roads and the work he and Owen had done earlier , Mehren redirected part of the route to add more scenery and eliminate substandard surfaces such as those found along the 9712 and 7100 roads between the Ken Wilcox Horse Camp and Cashmere. A tour book was created and provided to the 54 participants. Following the tour, the tour book and GPS routes were made available through the Sound RIDER! online store to other dual sport and adventure enthusiasts. In 2010 a route was conceived and mapped by Bryce Stevens and Andrew Cull. 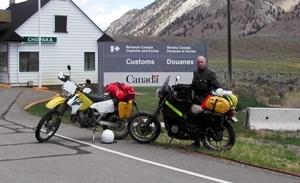 Stevens and Cull drove the route in a 4x4 vehicle (Toyota FJ Cruiser) in late July and early August 2010 to scout the roads, create a GPS track, mark waypoints for intersections, and to prepare for the initial motorcycle expedition. The motorcycle expedition took place in late-August 2010 with five motorcycles (BMW and KTM) and two support 4x4 vehicles. The route was released by Butler maps in the late summer of 2010. Photo: BMW North America rider Heli Kornton rode an entire WABDR route as it was laid out in 2009 for the Sasquatch dual sport tour. Heli seen here along Bethel Ridge with Mt. Adams in the distance. It's highly likely that even before Gaudreau and Noble rode the route in 2002 , people had been driving and riding the entire stretch of the route, calling it whatever they may have called it. Prior to this period, GPS units were scarce. Without a GPS one might need to add a few extra days to the four day time it takes, since many junctions are not marked and would require plenty of map fumbling as well as hit and miss backtracking otherwise. And no doubt, there may have been pioneers, fur trappers and traders commuting between Oregon and Canada on similar routes, although a search for such lore turns up nothing. If you're a dual sport enthusiast and have yet to ride the length from the Columbia River to the Canadian border, take the time to research the options and enjoy the ride. Photo: Norm Haugen and Jeff Miller pause atop Table Mountain for a view while riding on the route during the 2009 Sasquatch tour. ROUTE UPDATE: The Butler Maps version of the WABDR has several issues not in favor for riders. Several of the roads are washed out, one was terminated long before 2010, several are extremely dangerous and have proven to break a number of bikes and riders, while another takes riders onto private property. The Washington Cascades route used during the 2009 Sasquatch Dual Sport Tour continues to be passable, safer, legal and includes nicer scenery along the way.